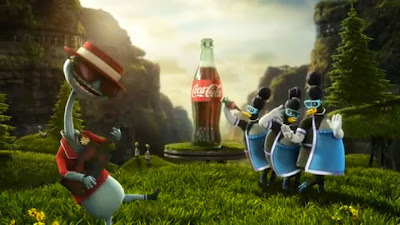 Weighty Matters: Coca Cola's latest predatory cartoon proves why voluntary advertising commitments are useless! Coca Cola's latest predatory cartoon proves why voluntary advertising commitments are useless! A few days ago I debated Diane Finegood about the perils of partnering with the food industry. In my slide set, there's no doubt that Coca-Cola had the lion's share of examples of partnership gone wrong and seemingly nefarious intent. "Coca-Cola North America will not place any of our brands' marketing in television, radio and print programming that is primarily directed to children under the age of 12 and where the audience profile is higher than 35% of children under 12." I do notice a conspicuously missing medium. Perhaps that's why just two weeks ago Coca-Cola released this nearly 7 minute cartoon called, "The Great Happyfication"
After all, kids under 12 don't ever use the Internet, or do they? But Internet aside, that's not the explanation Coca-Cola is providing for why this is a kosher video. 'The characters are not "kiddie", neither are the scenarios portrayed. There are many animated properties - e.g. The Simpson's, Family Guy etc. - that use animation as the medium but that are not targeted to children." There are cartoons out there that don't target children. Therefore this doesn't target children. Do we really need any more examples to prove that "voluntary" means useless, and again I need to ask the question, why isn't the Internet part of the media included in Coca-Cola's Children's Food and Beverage Advertising Initiative "pledge"?